There is no dearth of innovators in the country; but their creativity seldom gets the recognition it deserves. With the dual aim of insuring that innovators get their due and to popularise their inventions for the benefit of the masses, Kamaljeet, a volunteer of Honeybee, an NGO at Rohtak, has been making relentless efforts under the aegis of the National Innovation Foundation. Thanks to the initiative, hundreds of innovators have been recognised at the national level. Nearly 20 innovators of the region, identified and promoted as part of the campaign, have been honoured with national awards by the President himself. Many innovators, hailing from a rural background, have applied for and got patents for their inventions through the foundation. The useful agricultural and other techniques developed by many others are also being popularised far and wide by Kamlajeet and his team. 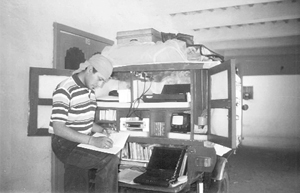 “Many a time, talent goes waste or remains confined to a small area due to lack of a proper procedure to incubate it,” observes Kamaljeet, who has himself conceived and developed “Saksham”, a mobile office based on a motorcycle; “Nalini”, a two-seater car running on a motorcycle engine; and a portable community radio station along with his friends Vikas Markandy and Dayal Singh. As of now, he is working on a plan to reach out to the farmers of the region through Hafed to provide them valuable information and to receive details about useful techniques developed by them. “We hope to get a good response from the farmers and villagers,” says Hafed district manager V.K.Sangwan, sounding quite enthusiastic about the venture. Love and compassion are by and large attributes not associated with the police. But, there is one cop who has not only displayed these qualities himself but also inculcated them among Hisar’s residents and fellow policemen, even if it’s with regard to animals or, to be specific, cows. 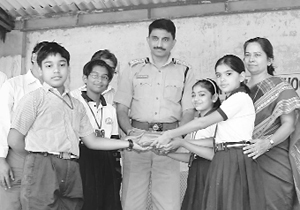 Superintendent of Police Shrikant Jadhav has made the campaign to provide a shelter to stray cows his mission, earning kudos from all and sundry. Mission Stray Cattle, launched just a few months ago with the help of members of the Gauseva Samiti, has resulted in more than 1100 stray cows finding a suitable home in various gaushalas of the district. The samiti has also collected Rs 50 lakh so far through donations that have been pouring in not only from philanthropists but even schoolchildren. This money is being used to buy fodder for the cows in the gaushalas. The samiti gives Rs 6000 per cow annually to ensure a regular supply of fodder. The response has been so tremendous that the samiti is now planning to set up a modern gaushala, complete with a veterinary clinic and gobar gas plant as an example for others. It has requested deputy commissioner Deepti Umashankar to take up its cause with the government for allocation of the 600 acres owned by the Government Livestock Farm in Hisar for the gaushala. Jadhav has also suggested that shamlat land in villages be given on nominal rent to gaushalas for growing fodder on a cost- effective basis. Jadhav says he thought of launching the campaign when he visited an accident site where four officials of the Horticulture Department lay dead, trapped inside their jeep. The indifference of the passersby upset him and he thought of doing something that would sensitise the residents to this cause.